The ioTrust Security Solution is Entrust Datacard’s latest security platform. Leveraging decades of expertise in cryptography, embedded systems and trusted infrastructures, Entrust Datacard created ioTrust to provide enterprises with secure and timely delivery of data across IoT ecosystems. The end-to-end solution offers scalable deployment options that provide on-premise and cloud management models to accommodate a wide variety business needs. How can ioTrust improve connectivity in ICS IoT ecosystems? ioTrust securely authenticates and authorizes devices, applications and people within a trusted IoT ecosystem. Once these identities have been issued, ioTrust improves connectivity in the ICS IoT ecosystem by securely routing data from an IoT device to its final destination, whether that is a cloud data hub or an on-premise enterprise data hub. What are common cybersecurity risks in ICS IoT ecosystems and how can ioTrust prevent them? Attacks on ICS IoT ecosystems are often motivated by a desire to create physical damage or compliance issues, or perform espionage on the ecosystem. Through a series of techniques, such as malware, man-in-the-middle attacks or credential theft, and a series of access strategies, including vendor back doors or shared VPN credentials between staff and third parties, these attackers can cause exponential damage in a matter of minutes. The IoT’s elimination of barriers between systems vastly increases the attack surface of these environments, making secure connectivity vital. At Entrust Datacard, we believe that if you can trust the identity, you can trust the transaction. But if a weak credential is stolen, the attacker essentially becomes a trusted identity on the network. To combat this, ioTrust protects the digital identity of devices, and also limits the privileges of those devices. By authenticating and authorizing devices, ioTrust helps IoT ecosystems securely operate by being able to trust the source and destination of critical commands. This is particularly useful for complex supply chains that require multiple suppliers. For example, a car contains many electronic control units, and each control unit has its own manufactured components. An automotive OEM will demand that electronic control units and their components can be uniquely identified throughout the supply chain -- all the way to final assembly. Then, once the car is on the road, electronic control units may need to be replaced, and OEMs will again demand that those replacement parts are also securely and uniquely identified. When it comes to the operational state, a device secured with ioTrust within the supply chain can also be utilized once it leaves the manufacturing plant. Manufacturers can commercially benefit from selling products that are ready to integrate into an overall security ecosystem. These devices can quickly deliver services for revenue generation and also create efficiencies, but only if they can quickly enter an operational ecosystem as a secure device. Scalability, and rapid go to market of devices that are ready to become part of an ecosystem provide a new competitive advantage for manufacturers. In laymans terms, how would a manufacturer go about installing and operating ioTrust in their facility? Within a manufacturing environment, ioTrust consists of a service gateway, which is made up of a subordinate certificate authority, policy engine and management console user interface. This software can either be installed on-premise or in a cloud environment, based on the manufacturer’s business needs. Is it a costly process in terms of purchase and manpower requirements? The ioTrust Security Solution is designed to minimize manpower requirements. The user interface and implementation process are intended to be easy to use and quick to roll out, so non-specialized staff can easily manage it. Manufacturers are given the option of employing Entrust Datacard to completely host the solution or install a pre-provisioned appliance, making it a turnkey implementation. In addition to manufacturing, what other industries does ioTrust benefit? The Entrust Datacard ioTrust Security Solution is designed to secure IoT data across a variety of industries. Aside from the manufacturing industry, ioTrust stands to benefit the automotive industry by allowing secure communication between internal domains, such as the brake system and engine, and external domains, such as the vehicle and a stoplight. For the smart cities, ioTrust is equipped to securely deliver data across utility management, power generation, transit and emergency services infrastructures. And for telecommunications, ioTrust permits the secure transmission of information between personal devices, like smartphones, and company intranets. 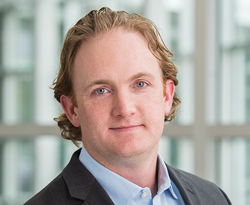 Josh Jabs is the vice president of PKI and IoT solutions at Entrust Datacard. He has more than 20 years of experience gauging the practical impact of changes in the technology ecosystem, most recently with the rise of the Internet of Things. Jabs also served as the vice president of global government solutions at Entrust Datacard prior to his current role. Before joining the company, Jabs directed investor engagements as an equity analyst in the security and financial technology sectors at Roth Capital Partners and Piper Jaffray. He also held roles within the United States government, specializing in new technology investments and security research. Jabs holds an MBA, a master’s in electrical engineering and received his bachelor’s degree in electrical engineering from the United States Air Force Academy.